NRA Rewrites Fairy Tales With More Firearms, Less Bloodshed : The Two-Way The NRA is publishing a series of twists on classic tales — picture Gretel with a rifle in the witch's gingerbread house. The stories themselves are remarkably devoid of violence. 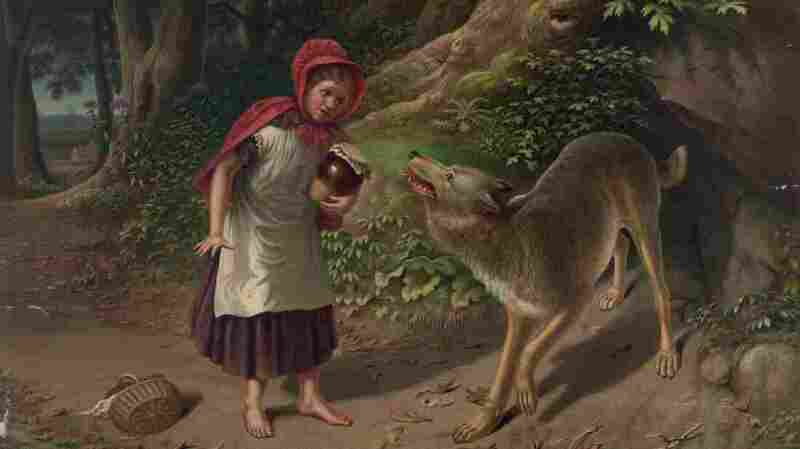 In "Little Red Riding Hood," a young girl and her grandmother are attacked by a wolf, seen in this 1870s illustration by Alfred L. Sewell. In the NRA version, Red wards off the wolf with a rifle. Adding guns to the world of the Brothers Grimm drastically reduces death rates, according to a study — well, OK, according to a couple of stories published by the NRA. So far, there are only two data points. And they're imaginary. But the trendline is clear: In the NRA's reimagined fairy tales, putting rifles in the hands of children creates a safer world. 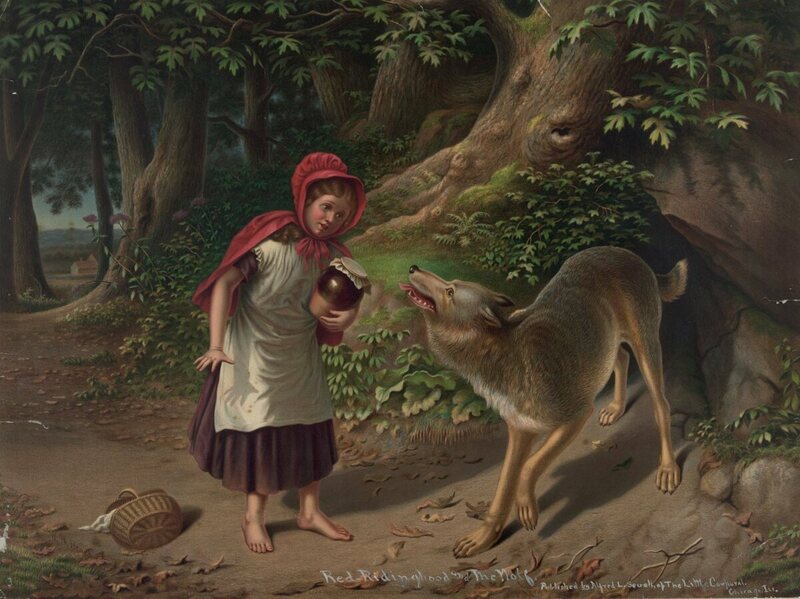 The NRA Family site published its first reimagined fairy tale — "Little Red Riding Hood (Has A Gun)" in January, and followed up with "Hansel and Gretel (Have Guns)" last week. On Twitter, inspired by the series, a few people have been inventing their own #NRAfairytales, imagining tales that begin with "once upon a time" and end with a bang. "The porridge was too cold, the bed was too hard, but this AK47 is just right," @Scott_Craven2 offered. "Who's up for some bearskln rugs?" But the NRA's own stories — written by Amelia Hamilton — are noteworthy for their nearly complete lack of violence. Fairy tales, of course, were notoriously gory and grim in their original incarnations. But the NRA's versions take place in a utopia filled with empowered and unharmed children. Take Little Red Riding Hood. In the original, a young girl and her grandmother are both devoured. A woodcutter with an ax kills the wolf and rips him open, saving the two women. "The wolf leaned in, jaws open wide, then stopped suddenly. Those big ears heard the unmistakable sound of a shotgun's safety being clicked off. Those big eyes looked down and saw that grandma had a scattergun aimed right at him. He realized that Grandmother hadn't been backing away from him; she had been moving towards her shotgun to protect herself and her home.
" 'I don't think I'll be eaten today,' said Grandma, 'and you won't be eating anyone again.' Grandma kept her gun trained on the wolf, who was too scared to move. Before long, he heard a familiar voice call 'Grandmother, I'm here!' Red peeked her head in the door. The wolf couldn't believe his luck—he had come across two capable ladies in the same day, and they were related! Oh, how he hated when families learned how to protect themselves." The wolf is carried away by the hunter, to an undefined but unpleasant end. Or the classic Hansel and Gretel, where two children are abandoned in the woods to die, then imprisoned as food and slave labor, until a witch is killed by, um, forcible cremation. In Hamilton's version, the family's hunger prompts not the abandonment of the children, but a hunting trip. The two kids set out into the woods to feed the family. Gretel takes down a 10-point buck before they head home and, as in the original, get lost in the woods.
" 'We're going to get you out of here,' Hansel told the boy, hoisting himself up and climbing into the window, helping Gretel in after him, for he was stronger than his sister. "The boys directed Hansel to the key that would unlock their cage while Gretel stood at the ready with her firearm just in case, for she was a better shot than her brother. Hansel unlocked the cage and opened the door. The hinges gave a groan and the sound of the witch's snoring stopped, the silence filling the room as they looked at each other in panic. Gretel got her rifle ready, but lowered it again when the snoring resumed. They helped the boys back out the window and hurried into the forest, breathing a sigh of relief when the cottage was out of sight." Guns reappear when the well-armed local populace march on the witch's cottage. The villainess is imprisoned by the local sheriff, "to be taken away so she could never harm another child." Maybe they'll inspire some other advocacy and lobbying groups to defang disturbing fairy tales. Will the pharmaceutical industry take the bite out of Snow White's poisoned apple? Will PETA soothe the angst of the Boy Who Cried Wolf, when the townspeople realize the joys of an animal-free life and set loose their sheep? Will agribusiness harness Jack's beanstalk? The NRA series has inspired some criticism, as The Washington Post has noted: Gun control advocacy groups have decried it for advancing gun culture. Gun rights advocates, meanwhile, have mocked liberal objections to the stories, pointing to the sheer horror of the original tales. But the NRA is pretty clear about its own intent: The stories are tagged "Fun Friday" and "Just for fun" on the site.